Bharti Airtel is counting on its "endearing" brand to build on its acquisition of Zain Telecom's African operations. In addition, it aims to do what Indian companies are getting increasingly known for: Reduce costs. Airtel will replace Zain and become the brand of the combined entity in each of the 15 countries in Africa that Bharti will enter as a result of the $10.7 billion acquisition. "Bharti Airtel has been the number one endearing brand in India and our objective is to repeat the same positioning in the African states, too. The Airtel brand will be the key to our business success in these countries. It will be positioned as a global brand. However, in its implementation, we will use a lot of vernacular language, looking at local needs," Manoj Kohli, who will head Bharti's African operations, told Business Standard. According to Kohli, Bharti's African strategy will not merely replicate the Indian model. "We will have an innovative model. Our model for Africa will not be exactly the same as in India. It will be superior to India (model), as we can learn from our Indian experience." As the details of the Africa strategy are still being worked out, Kohli is quick to name the advantages. "The key areas of synergy will be in procurement, information technology network, call centres, and data centres - just to name a few." Kohli also said the company will have an organisational structure of expatriates from Bharti, employees of Zain and new recruits into the international team. 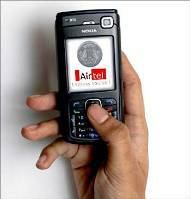 In a falling stock market today, Bharti Airtel's shares rose 0.35 per cent to close at Rs 312 per share. The stock has recovered from the free fall that it saw after its talks for a deal with Zain were first made public. Analysts say that this recovery in the stock price is not only because of increased positive sentiment on the Bharti-Zain deal. "Recovery in the stock price reflects that markets have also done well," says Rajat Rajagriha, Director-Research, Motilal Oswal Financial Services. Besides, all the telecom stocks have been performing well in the last few weeks. "Earlier, there were pricing pressures in voice services, and more pressure on new service providers launching operations and introducing newer schemes. There were no new schemes which have hit the market in the last two months. That's the reason why the stock has risen in the last two months," says Nishna Biyani, Analyst, Prabhudas Lilaldher. Going ahead, concerns on the Zain deal and its implications on the stock price remain. Markets have retained their view that the deal is overpriced and do not expect it to be earnings-accretive in the next one or two years. Analysts say a lot more clarity on the contours of the deal are required to make an assesment of the earnings from the stock. "Even now, no extra clarity has come in. The job will be to wait and watch if this deal can make any significant earnings over a period of two years," says Anand Tandon, Director-Equities, BRICS Securities. Bharti has raised $8.3 billion debt to fund this deal. "The primary concern is to see how they are going to take the pain of increased debt burden," says Rahul Jain, Analyst, Angel Broking. Moreover, the success of how Bharti will replicate its low cost operational model in Africa is yet to be seen. Analysts warn that it took 10 years for the low-cost model to become operational in India. "Markets may want to see any improvement in the underlying profitability in these operations, with the new management coming in," says Rajagriha. Besides, analysts also expect that Indian market itself may throw up some challenges, adding to strain on Bharti's management. While concerns remain, some analysts feel the stock might not take any extra hit with regards, to the Zain deal. "Impact of the Zain deal is priced in. No more stock movements are expected on that account," says Jain. The stock is expected to be range bound in the next one year. "The stock has been trading at almost 14 times its price to earnings ratio, which has factored in one year's forward earnings. In the next 12-18 months, we expect the stock to trade in the Rs 290-340 range," says Biyani.